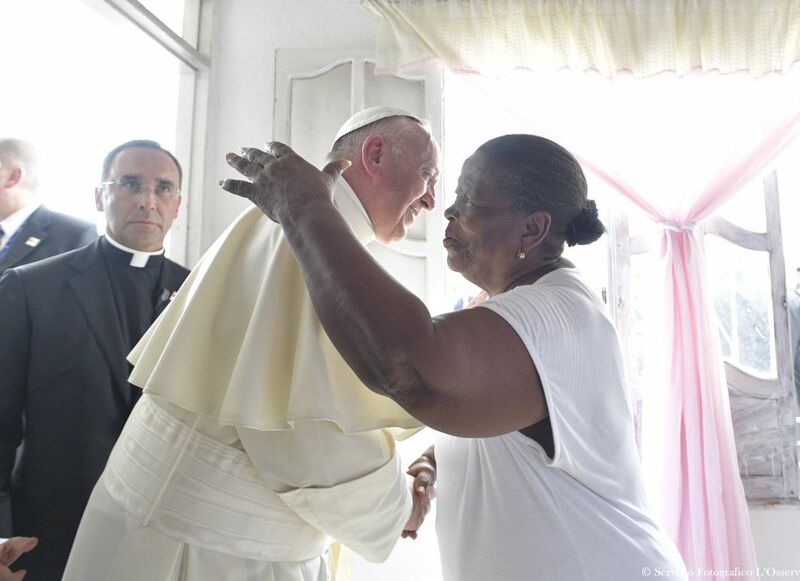 Despite suffering a cut and black eye, Francis completes a five-day visit with praise for St. Peter Claver, a 17th-century missionary who insisted on treating slaves with dignity. CARTAGENA, Colombia — Pope Francis wrapped up his Colombia trip with a deeply personal final day Sunday honoring St. Peter Claver, a fellow Jesuit who ministered to hundreds of thousands of African slaves who arrived in the port of Cartagena to be sold during Spanish colonial times. Francis’ visit to Cartagena got off to a rocky start, however, when he banged his head on his popemobile when it stopped short amid swarms of well-wishers. Francis, who only had a hip-high bar to hold onto, lost his balance and suffered a bruised, black left eye and a cut on his eyebrow that dripped blood onto his white cassock. The cut was quickly bandaged with a butterfly patch and Francis carried on without incident with his program. Once recovered, Francis visited the St. Peter Claver church, where he praised the 17th-century missionary for having recognized the inherent dignity of slaves. Claver, self-described “slave of the slaves forever,” has been revered by Jesuits, popes and human rights campaigners for centuries for having insisted on treating slaves as children of God and worthy of love when others considered them mere merchandise to be bought and sold. Like Claver, history’s first Latin American pope has insisted on ministering to society’s most marginal. He takes special care of the homeless who live around the Vatican, makes regular phone calls to prisoners, brought a dozen Syrian refugees home with him from a Greek refugee camp, and embraces the sick, the maimed and the deformed every chance he gets. Francis prayed at Claver’s tomb after laying the foundation for new residences for homeless people in Cartagena, the city famous for its UNESCO-awarded colonial center but also home to slums and shanties. He was to celebrate Mass in Cartagena’s port Sunday before returning to Rome, ending a five-day visit highlighted by a huge prayer of reconciliation that brought together victims of Colombia’s long-running conflict and demobilized guerrillas and paramilitary fighters. Francis had refrained until Sunday from speaking out about the political and humanitarian crisis next door in Venezuela. But in remarks added to his Sunday prayer, he called for an end to political violence in Venezuela and protection for the poor.